Learning how to make gift baskets is a fun way to create personal gifts for friends, and even if you buy a gift basket to give, you know that it will always be hugely appreciated by the recipient. What is there to not love about a beautiful Spa Gift Basket? Its like giving the gift of a day at the spa, without forking over the big bucks it would take to actually pay for a day at a fancy spa! Whenever someone talks about going to the spa, the image that comes to mind is one of a calm and beautiful place where you go to be pampered and to relax. People leave spas feeling peaceful, centered, cared for and beautiful. You can create that experience for someone by giving her a spa gift basket. The combination of items and ingredients you'll find in a great spa gift basket is almost endless, and you can choose one that is perfect for the personality and style of the special person you're giving the spa basket to. 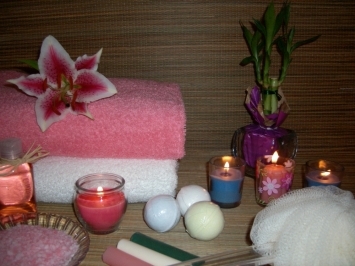 Spa gift baskets might contain any of the following items: bath pillow, bath towel, loofah sponge, bath salts or bath oil, scented body wash, scrub and moisturizer; and candles or aromatherapy oil. Or maybe a pumice stone or exfoliating tool, nail polish, foot massage cream, pedicure tools and comfy slippers or socks would be included. You can find spa gift baskets that include herbal tea, a mug, candles or aromatherapy oil, and a soothing music CD. You might find a spa gift that contains all of these items and even more. And if you think that spa gift baskets are only for women, think again. While women are typically the recipients of such gifts, you can find spa gift baskets for couples and men, too. A spa gift for a man might include body wash and cologne or scented moisturizer, manicure tools, shaving tools, loofah, body brush, and bar soap. And a “couples spa gift set” could feature massage oils, a massage book, flavored oils, chocolates, robes and slippers, romantic music, bubble bath, candles and more. You can find spa gift baskets in scent themes, too. Rose, lavender, citrus, vanilla, and specialty scents, like fresh linen or sea breeze, are popular. For someone who finds a certain scent particularly calming or rejuvenating, you can choose a gift basket that is scent-themed. If you want to add some extra touches to go with a spa gift basket, you could include a book of poetry or a small journal to write in. Or add a small decorative waterfall, a set of seashells or polished stones in a bowl, a green plant, or a small photo frame so that the lucky recipient can enjoy a meditative focal point while relaxing. Spa gift baskets can make excellent gifts for just about anyone. You can give them to the women in your life – everyone from your mom, to your child's favorite teacher, or to your friends. If you have a man in your life who likes to look, feel and smell great, a spa gift basket can make a great gift. And if you know a couple who would enjoy some quality pampering time, a basket of spa gifts is a thoughtful and fun choice.